This weeks book companion was a perfect fit for my short week. The book I used was Just a Snowman by Mercer Mayer. 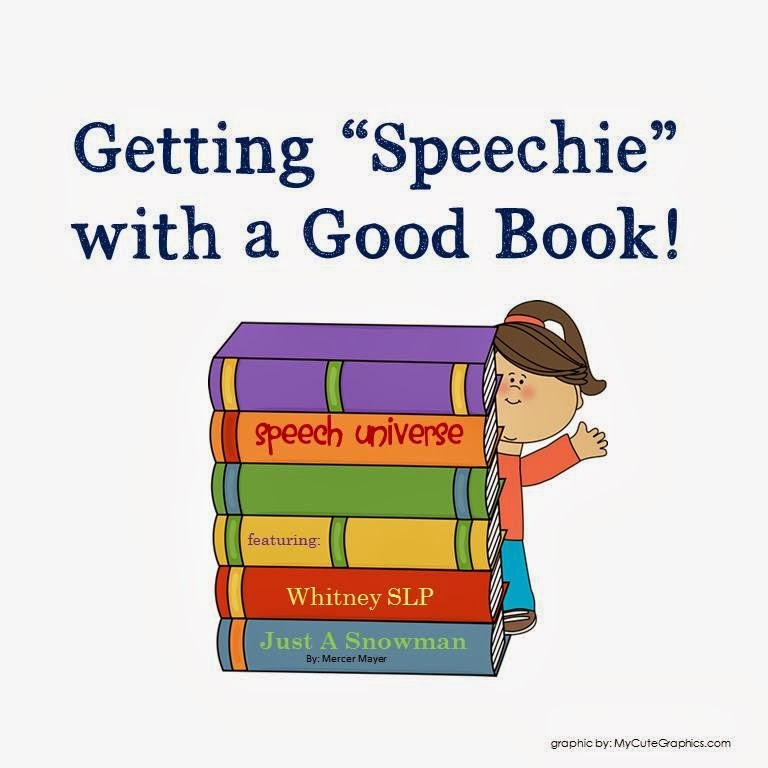 The book companion was by Whitney SLP. The reason this book was so perfect is that it focused on a snow day for Little Critter. My students definitely had some prior knowledge on this one! We had three snow days this week! I tried two things a little differently this week. First, I purchased this book through iBooks for my iPad. I have not previously purchased a childrens book on my iPad, but I liked using it that way. The second thing I did was print the entire packet with 2 pages per piece of paper. My printer gives me the option of multiple pages, so I tried it out. It worked perfectly for this packet! Sequencing: there were three great sequencing sets included. The main set was for pictures from the book with short sentences included. The other two were for making a snowman and making hot chocolate. Question Comprehension: There are two sets of these- one set that has picture choices for answers, and one set that does not have any answer choices. This is great for differentiation within groups. Writing Prompts- this includes two different story maps, compare/contrast activities, and vocabulary prompts. Also included are: coloring pages and an open ended articulation page. These activities were all really cute. My students all loved the book too. It was really relevant for them this week. We had some great discussions about things they like to do on snow days, and compared them to the things that Little Critter did in the book. Stop over there and say hi! Yay! I'm so glad you like the packet and it related so well to your kiddos this week. Thanks so much for the review!